All new captions and word balloons are combined with the original, untouched DC comic book art to create a wacky satire of the romance comic books of the 1950s -1970s. Once upon a time, women grew up believing that one day they would meet Prince Charming, get married and live happily ever after. Women today, however, face a scenario that often goes like this: Girl meets Boy. Boy is gay. Girl meets another Boy. Girl finds out boy is married. Girl seeks therapy. 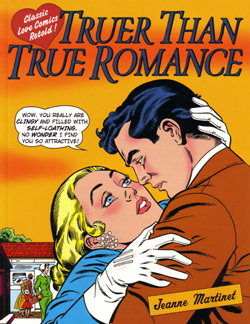 In Truer Than True Romance, Jeanne Martinet revisits the romance comics of yesteryear to give us humorously irreverent new tales of betrayal and heartbreak. Ten classic DC comics romance stories are rewritten so that “In Favor of Love” becomes “My Heart Said Yes, But My Therapist Said No!” and “Stolen Dreams” becomes “I Hate My Hair!” The original, unedited splash pages and summaries of the original plots are included. And, as the original comics always contained super-sappy advice columns (written by men passing as experienced and well-intentioned women), new “advice” columnists are happy to help in Truer Than True Romance — experts like “Dee Presson,” who is a lot more realistic, even if she is a bit of a downer.